I was introduced to this scene by a friend many years back. It’s located along a canal and shows the falls between two levels. The key to this photograph was the long exposure, 15 seconds in this case. It allowed the water to blur, giving it that nice milky look as it goes over the rocks. It also lets the water at the bottom begin to swirl and flow into a circular pattern. Ideally I would have liked more of the swirling water at the bottom, but on this day there was a lot of very slow moving foam just out of view that didn’t look very appealing, so I framed the image without it. Perhaps a slower shutter speed could have blurred the foam enough to include it, but I didn’t have a neutral density filter with me that day. I achieved the 15 second shutter speed by setting my ISO to the lowest setting (ISO 200) and closing down the aperture all the way (f/36). Thankfully it was an overcast day so I didn’t have to worry about harsh sunlight creating extreme contrast or blowing out the highlights in the water. I’m thankful to my friend for showing me this peaceful and beautiful location that I might have otherwise overlooked. Angular Flow No. 1 is a more abstract photograph than I usually create. 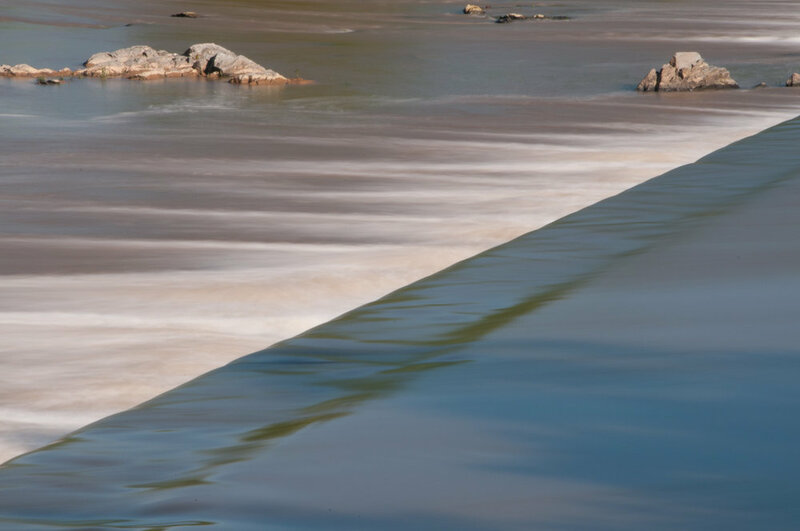 It depicts water flowing over a dam above Great Falls on the Potomac River, which flows between Maryland and Virginia and past Washington, DC. I had been on the Maryland side of the river photographing the falls and also some of the many Great Blue Herons that congregate at the falls looking for fish. A little later in the day, while standing on a platform overlooking the dam above the falls I was taken by the interesting lines and tones as the water flowed over the dam. I liked the look of the flowing water, and how the dam created a distinct line between the darker water above the dam and the lighter water below the dam. 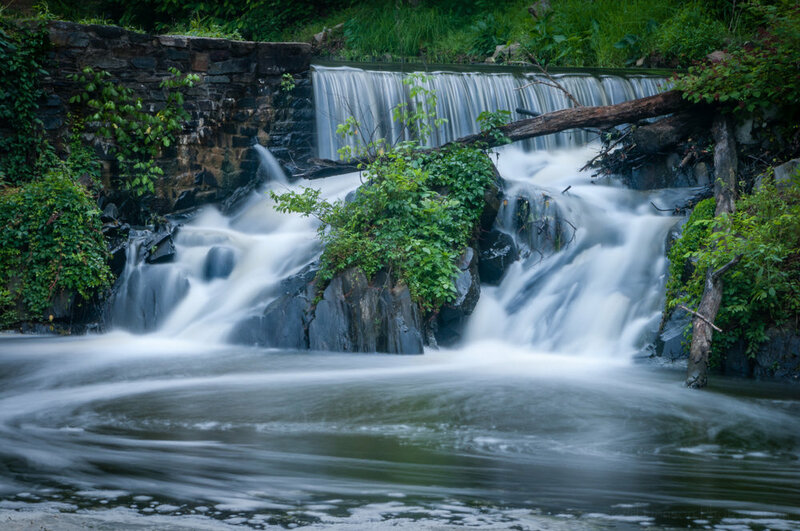 I figured a slow shutter speed would accentuate this, smoothing out the water and showing all the different tones, helping with the abstract nature of the scene. I wanted a slow shutter speed but I didn’t have a neutral density filter with me, so instead I stopped the aperture of my lens down as far as it would go, f/36 in this case. Stopping down the aperture limits the amount of light that gets through the lens to the camera sensor. 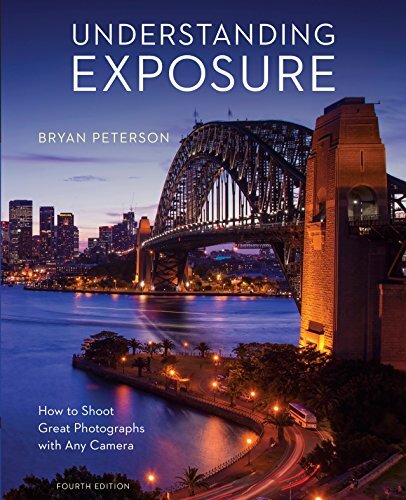 That’s why it lets you use a slower shutter speed, the sensor needs more time to collect enough light for the exposure. Stopping down the aperture also increases the depth of field. I wasn’t all that worried about the depth of field in this case, but it does help assure the line of water going over the dam is in focus. Be aware, using very small apertures can also adversely affect the sharpness of a photograph due to diffraction. In this case I wasn’t as worried about that, as the subject was flowing water. 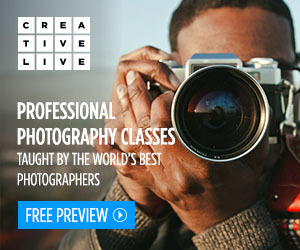 But you may notice your photos are a little soft when you use the smallest aperture. If this happens open the aperture a little more. Setting an aperture of f/36 and keeping my ISO as low as I could (ISO 200) let me keep the shutter open for 5 seconds (requiring a tripod), creating just the sort of look I was after. Below you can see the raw image I started with before making any adjustments in Adobe Lightroom. This is an unprocessed raw, so it is naturally a little flat. I didn’t think the rocks in the background added anything to the image, as I was most interested in the water, itself. So I cropped out the top part of the image. I also noticed the rocks were not very sharp. Next I tweaked the white balance and made various other adjustments to bring out a little more contrast between the different parts of the frame. As you can see below, the blue, reflected from the sky, begins to look a little unrealistic. But I had in mind a monochromatic photograph to concentrate on just the tones and lines so I wasn't worried about how the colors looked, just how the contrast and patterns looked. Finally, I converted the image to black and white and tweaked all the color channels to adjust the levels of grey associated with each color. I brought up the whites and darkened down the blacks. In the color images the water flow was not quite horizontal, there was a slight upward tilt towards the left. So I rotated the image just slightly to make the water flow more horizontal. I thought about cropping such that the diagonal line of the dam ran from one corner to the other but I actually preferred the look where the line ends just above and below the corners. Let me know what you think in the comments below. Would you have done things any differently? 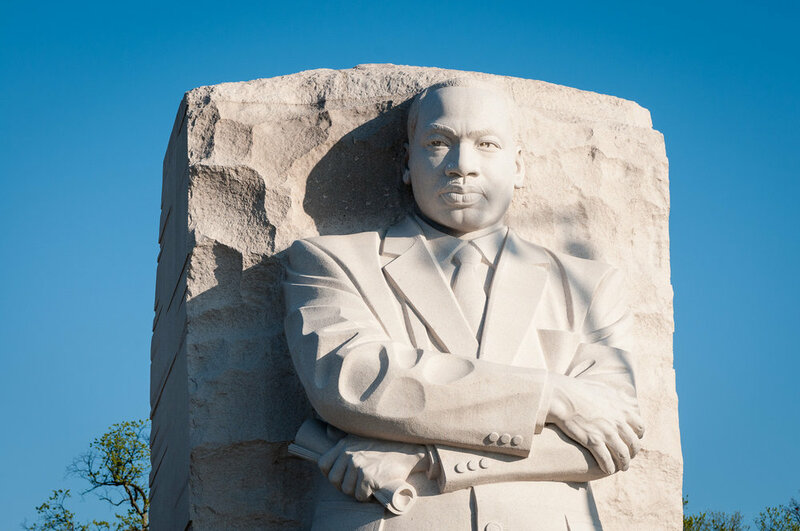 In commemoration of Martin Luther King, Jr.’s birthday let’s take a short visit to the Martin Luther King, Jr. Memorial, located in West Potomac Park in Washington, D.C. The street address of the memorial is 1964 Independence Avenue, S.W., referencing the year the Civil Rights Act of 1964 became law. The memorial opened to the public in 2011. The design, created by ROMA Design Group, centers on a large stone sculpture created by the Chinese artist Master Lei Yixin. 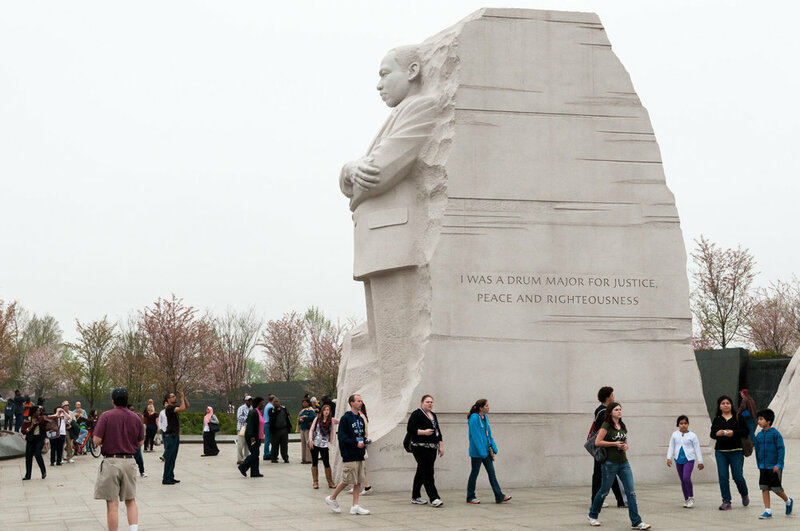 In the sculpture Martin Luther King, Jr. is seemingly pulled from a mountain of stone behind it. 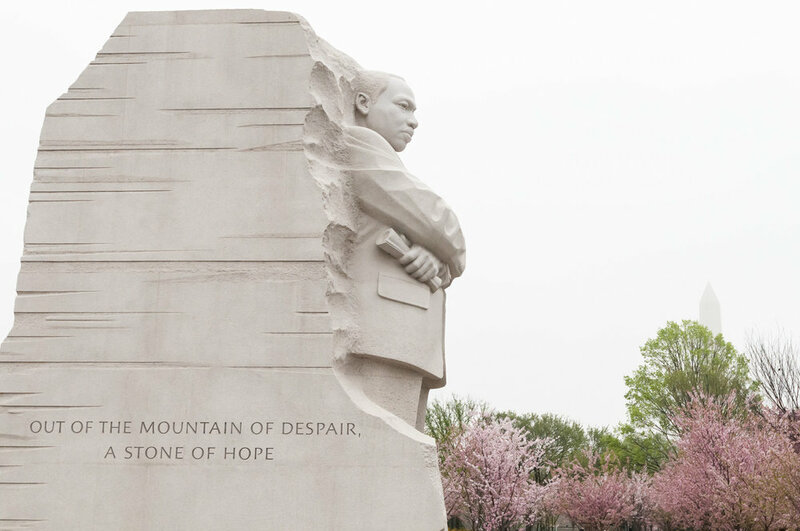 The theme for this design came from part of the 1963 “I Have a Dream” speech where King said, “With this faith, we will be able to hew out of the mountain of despair a stone of hope.” Behind all this is a curved wall of quotations facing the tidal basin, and wide walkways to accommodate large numbers visitors. It didn’t take long before there was some controversy surrounding the memorial. One of the quotations on the side of the main sculpture read, “I was a drum major for justice, peace and righteousness.” This was a paraphrase from the longer, “If you want to say that I was a drum major, say that I was a drum major for justice. Say that I was a drum major for peace. I was a drum major for righteousness. And all of the other shallow things will not matter.” Some people felt the paraphrased quote misrepresented King’s words, so in 2013 the text was removed from the sculpture. I photographed the memorial both with and without the controversial quote. Seeing how things do change over time reminded me why it’s important to take the time to photograph subjects when you’re there, regardless of whether you think the photo might turn out well. Sometimes it’s more about documenting something you may never see again, or something that may never happen again. Times do change, and we won’t always have a second chance to go back and photograph it again. This is something I need to periodically be reminded of. Long exposure showing moving crowds around Martin Luther King, Jr. Memorial (drum major quote removed). This photograph is an Infrared black and white. 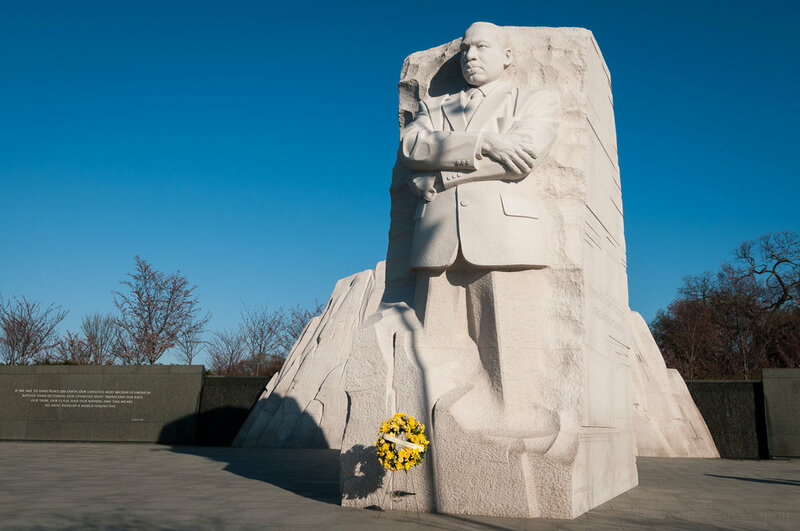 If you’d like to learn more about the Martin Luther King, Jr. Memorial visit the National Park Service website dedicated to the memorial. And by all means, if you have the opportunity, go visit the memorial and the many others in the area. 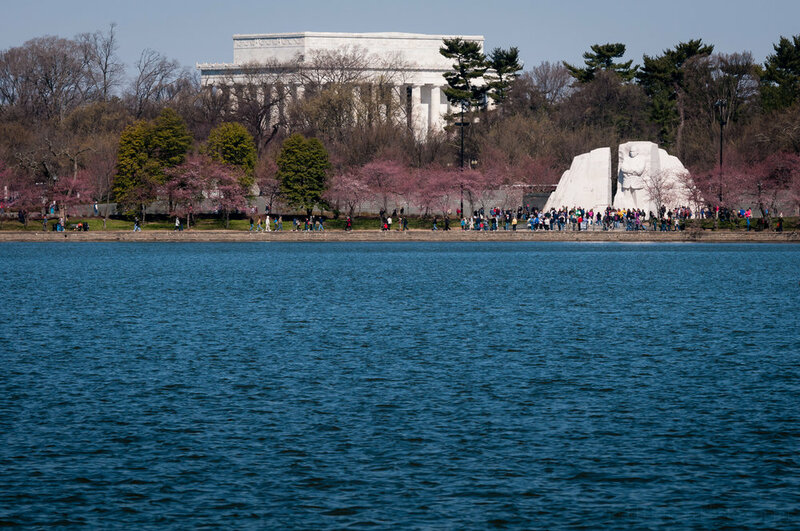 The tidal basin is especially beautiful during early spring when the cherry trees are in bloom. It gets very crowded, but it’s always worth the trip. Martin Luther King, Jr. was born on January 15, 1929. The American holiday marking his birthday occurs the 3rd Monday of each January. In 2017, Martin Luther King, Jr. Day is January 16. Some of the images in this post first appeared in Washington, D.C. Cherry Blossoms - 2016. 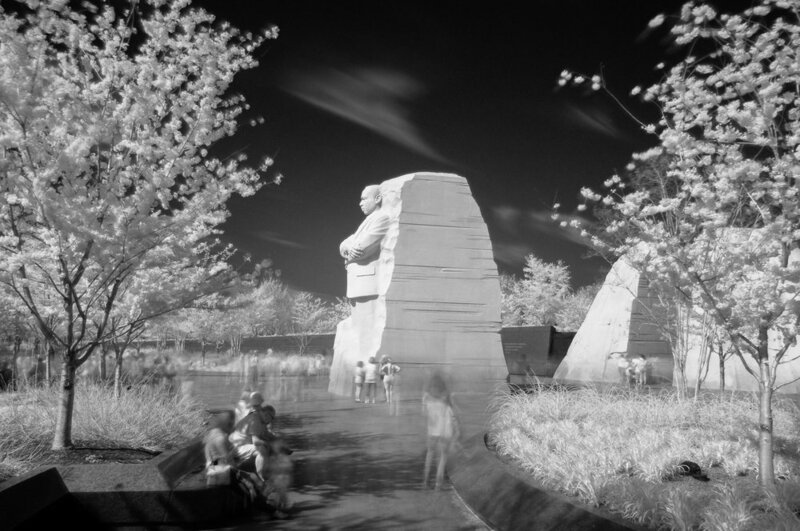 A different version of an infrared image of the Martin Luther King, Jr. Memorial was posted in Infrared Experiments During National Cherry Blossom Festival. And for images of more National Park lands, including monuments and memorials around Washington, D.C., check out National Park Service Centennial.